At last, you’ve finished your next blog post. You quickly look for an image on Flickr. You format your post in WordPress. You wait with hitting publish, so you can proofread one more time. You’ll do that tomorrow. With fresh eyes. And sometimes you wonder … does all this blogging pay off? Do you simply need to keep going to win more clients? Or are you fooling yourself? And wasting your energy? We all wonder sometimes whether we’re missing an important trick. Can we seduce more readers to buy? Follow today’s checklist to turn more blog readers into buyers. Start with sneaking into your reader’s head, and review whether you’re enticing him to read your post. Your headline arouses your reader’s curiosity because it mentions a benefit he’s looking for or a mistake he’s anxious to avoid. Your introductory paragraph makes him feel you’ve written your post especially for him because you empathize with his struggles. Your blog post delivers the promise you’ve given in your headline and opening paragraph. You always want to deliver on your promises, don’t you? Your subheads entice him to keep reading because you arouse his curiosity or promise a benefit. Your final paragraph inspires your reader because it takes away a key obstacle to implementing your advice. Your last sentence keeps humming around in your reader’s mind–just like a soundbite. To sell more, forget about selling for a moment. Put your readers first. Enchant your readers with helpful advice. Charm them with comprehensive checklists. Sweep them off their feet with an in-depth tutorial. Because that’s how you build trust. And that’s how you earn an opportunity to start a conversation and sell. You know the feeling when you talk to your best friend? She listens to you. She smiles. She asks questions. She makes you feel she cares about you. What about creating that same feeling with your blog readers? Engage your reader with questions in your blog post. The most enchanting questions include the word you. Get at the same wavelength, using the phrases he understands, and the type of humor he appreciates; avoid gobbledygook. Don’t ramble on. Don’t waste your reader’s time, because that’s a big turn off. Stamp out wordiness to show you appreciate your reader’s time. Vary your sentence length to make your voice more enthusiastic. Allow readers to get to know you by sharing itty-bitty stories about yourself. Add a dash of personality by making bland sentences sparkle. In writing, you can’t use body language to engage your reader and convey your emotions. To engage your readers, scrub all blandness from your writing. Make each word shimmer. Make each sentence sparkle. 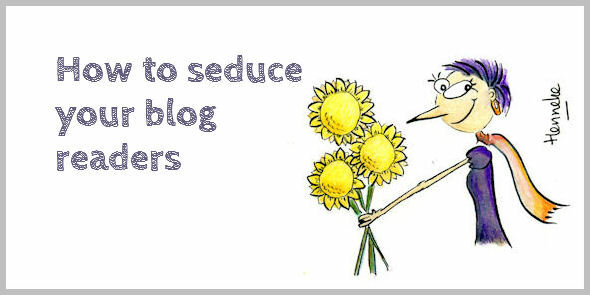 Writing seductive content isn’t enough to seduce your readers. You also have to make yourself look good. Welcoming. And charming. Use one-sentence paragraphs to make reading your post seem effortless. Avoid boring your readers with incessant chattering. Break up blocks of text that run over 6 lines. Introduce pauses in your conversation. Increase white space by using bullet points where you sum up 3 or more points. Don’t make them squint. Make your font size at least 16px–the font you’re reading is 18px. Keep their gaze. A line length exceeding 75 characters makes it hard for readers to focus. Add a dash of personality with a unique image. Does your blog design invite your readers to join your conversation? When you want to date someone, you find a way to stay in touch, don’t you? You email, text, or call. You drop by for a chat. Perhaps you even hand-write an old-fashioned postcard. Entice blog readers to join your email list, because that’s the best way to develop your relationship. Give readers a good reason to sign up. Tell them how you’ll make their life better when they join your list. Make it easy to join your list by having forms at the right locations–your home page, your about page, in your side bar, and below each post. Consider a two-step opt-in. Handpick posts for your popular posts section in your side bar. Select posts that convert readers into email subscribers. Consider using LeadBoxes in your most popular posts to further increase subscribers. Remove your RSS link from the side bar, because getting readers on your email list is more valuable. Welcome new readers with an email sequence–allow them to get to know you when they’re most enthusiastic about learning more. List your services in your email footer, on your about page, and on dedicated web page about your services. Include hints in your blog posts to remind readers what you offer–link to the books you’ve written, or refer to a recent client. Don’t be too anxious about sending promotional emails. Your readers want to know about special offers. When you genuinely help them week in week out, you earn your opportunity to sell. Always encourage feedback. My email footer says Would you like to get in touch? Just hit reply. I’d love to hear from you. Building a relationship requires a fine balance. You don’t want to be pushy. But you don’t want to be too distanced either. But when you put your readers first, you’ll find the right balance. When you sneak too many sales messages into your posts, you erode trust. When opt-in popups block the view of your content, you upset loyal readers. Readers sniff a whiff of sleaziness, a sign of insincerity. Boosting your business starts with a genuine commitment to help your readers. To make their life better. To have fun together. Don’t focus on selling. Be a good egg. Another great article, Henneke! Really appreciate all your advice. You do a great job at taking a lot of information and presenting it in an easily digestible format. I especially appreciated the reminder to remove the RSS icon … as email lists are so much more valuable. Thank you! Thank you, Nat. Good to see you. I don’t think an RSS icon adds any value. People who are keen to read your blog via RSS, know how to add it to their feed. I’ve never had an RSS icon on Enchanting Marketing. If I focus on selling, I think I would consider myself failed, because I’ve only sold two painting from my blog so far. My blog is not really a blog for business, it is a kind of artist’s and my personal journal, too. I don’t think my personal life and experience as a mother, wife and everything else can be separated from my art or my journey as an artist. Though comments are nice, and selling paintings are great, that’s not what kept me blogging. I enjoy writing, and sharing my thoughts. Whether people blog for business or not, I don’t think anyone can keep up with blogging on a regular basis unless they enjoy writing. That’s an important point, Lucy. Thank you for sharing. Writing becomes more enjoyable when you cut the writing process into parts, so you feel less overwhelmed. You may find this post useful: http://www.enchantingmarketing.com/blogging-schedule/. Also, make sure you choose a topic you’re passionate about. Writing about a topic you don’t care about is tough and boring. Good luck! PS You may also want to look into podcasting instead of blogging, but your course might not allow that? A very engaging and comprehensive post Henneke. The finesse is all so important, but knowing and feeling comfortable with your audience makes the task a lot easier. Yep, that’s an excellent point – as a blogger you also have to feel comfortable with your audience. The more you can see your audience as friends, the easier it is to share your knowledge and help them. Thank you for stopping by to add your thoughts & for sharing the post on social media, Mark. I appreciate it. Wonderful post. I especially liked how you linked to so many different posts (most of them internal Enchanted Marketing posts). Chopping the long list in a few short lists – each with its own intro and final paragraph – also gives the feeling it’s easy to read. A good egg. I like that! An excellent checklist. Each word crafted for us, the readers. I wonder how can you write every article as an example itself for the points mentioned in the article. Look at this post and checklist. You’ve followed ALL the points, making the article an example of walking the talk. You suggest – “Handpick posts for your popular posts section in your side bar. Select posts that convert readers into email subscribers”. How to do that? How can I know the posts which convert readers into email subscribers? Thank you so much for keeping the writing standard so high. As someone who teaches people how to blog, I have to walk the talk, don’t I? Excellent post and full of very practical tips. This year [and even yesterday!] I have been redesigning and rewriting all the key pages of my site. I now have opt in boxes in all the key areas and spent a LOT of time working on the About page. It’s taken all year to get to this point as I’ve been doing the design and writing myself – but it’s worth it as I now feel I have a site that I’m happy for people to come visit. Next step is a completely new blogging strategy starting in a few weeks that will have long content [using much of the key advice you wrote about]; video; a poster/postcard and downloadable activity/checklist. I’m going to post every 2 weeks and every 6 weeks my email list will get the Loving Life Dreaming digital magazine instead of a newsletter. I want to try a different format for delivering content. Thanks so much for this really useful post – always lots of practical content. One small thing that I see on a lot of opt-in forms (hope you don’t mind me mentioning it here – I can delete it again!). Instead of writing “Sign up and I’ll send you…”, try “Sign up and receive…” – it makes the reader feel a little more engaged. I don’t believe I’ve been by your blog before but I’m glad I’m here. I love this post and as I was reading down the list I was nodding my head along with you. Yep, we need to do that. Yep, that too and the list just goes on. Linking out to give us more information, well I think that’s a generous thing to help us all. Thank you for that and I definitely appreciate it. I normally have a lot to say, I’m kind of known for my long comments but I seriously don’t have anything to add. I mean why say anything else but compliment you on your hard work putting this post together. Amen to that right! Thanks again and hope you’ve been enjoying your week. Have a good one. Thank you for your kind words. Glad to hear you were nodding your head along! You are an excellent teacher, Henneke! And this is an excellent checklist! Thanks so much for sharing! THANK YOU! I didn’t even know I needed you, I don’t know how I found you, but I do know I’ve been reading and editing copy with your help, totally inspired and, dare I say, enchanted, for the past 2 hours straight. I had to rip myself away to pee. I have a lot to learn and a lot of work to do – I think I just realized by blog is a business blog of sorts, and I need to tie together the service I offer (www.openawarenessyoga.com) with the written insight I offer (www.insightinflux.com). I also think I need to remove some of my super long-format blog posts and make them into e-books or paper books and learn to blog like a blogger that gets traffic. It is so hard for me to be succinct, but it’s increasingly apparent it’s super important online. Just watching my own behavior online makes this apparent, especially now that I’m educating myself on copywriting. Yes, being succinct is hard, and it takes some tough editing to make content more concise. But over time it becomes easier. Thank you for your wonderful compliment, Raymond!